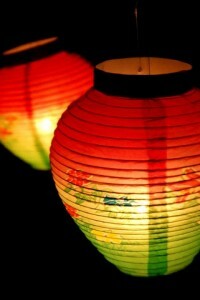 Chouchin are Japanese paper lanterns hung outside of buildings or gates. They are made of thin bamboo frame and Japanese papers, which are foldable like bellows. Mostly, they are designed pictures or written words on them. There are also handy ones to be used to light the way in processions. Chouchin have various uses; for example, adds for businesses, bon festival or interior decoration. Red-chouchin are often hung outside of izakaya (Japanese style bar), so the word, “red-chouchin” is sometimes used as metaphor for izakaya. Because the light of chouchin is soft and so relaxing, they are likely to be used inside of a house especially in a living room or a bed room.